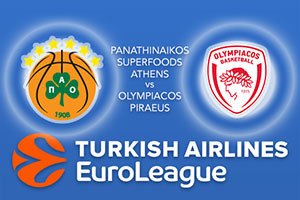 This all Greek clash is one of the many highlights of the Euroleague double-header. Both of these teams will be launched back into action swiftly after their exploits and efforts on Wednesday, but the fact that this is a domestic game being played out in the European arena will ensure that this is a match packed with excitement and drama. Panathinaikos lost out in Madrid on Wednesday, falling by three points in an 87-84 game. They were involved in the tie right until the end but the Spanish side always looked to have an edge and that ultimately split the two teams. There is a need for Panathianikos to bounce back quickly but they shouldn’t be too down-hearted over the nature of this loss. James Feldeine provided 19 points in the defeat, Nick Calathes notched 15 points while both Chris Singleton and Ioannis Bourousis grabbed 13 points in the loss. Wednesday night turned out to be a big game for Olympiacos and not just because they defeated FC Barcelona Lassa to claim a 4-3 record for this point of the season. It was a night of celebration for Vassilis Spanoulis who managed to score 15 points in the game while also providing 6 assists in the match. The history-making moment came with this 1,000th assist in his Euroleague career. There was also a celebration for the work of the defensive unit of Olympiacos who condemned the Catalan club to their lowest tally in the Euroleague. With a relatively short trip on the back of this home win, the Olympiacos side should feel fresh and they’ll fancy their chances of achieving success in the game. We could be in for a tight evening in this game but home advantage could have a part to play. With this in mind look to back Panathinaikos Superfoods Athens at -2.5 which is provided at odds of 1.90. There is also a lot to be said for looking at the Over/Under market in this Euroleague game, and you should go OVER 150.5 at odds of 1.90. Bet Now!